The Queensland Government today announced a framework for receiving unsolicited proposals as part of their 2015 Queensland budget. The aim is to help clear an infrastructure backlog, allowing companies to make submissions to the government as part of its promise to introduce innovative ways to deliver major projects. The online portal will be launched this week, allowing companies to make market-led proposals and fast-track the assessment process for the private bids. We want to send a very clear message to developers and investors that Queensland is open for business. Our government is focused on infrastructure delivery which is why we want to harness the knowledge and experience of the private sector. This portal will make it easier for industry proponents to submit a proposal, especially complex proposals with interest from multiple government departments. We're going to require government agencies to consider private-sector collaboration to bring projects on line as a priority. The new framework for unsolicited proposals comes after months of lobbying from industry and property groups for QLD to match similar schemes in NSW, VIC and WA. Property Council of Australia's state director Chris Mountford said a framework for Queensland will allow developers and infrastructure companies to approach state government with ideas to get projects off the ground. Developing an unsolicited proposals framework would cost the government very little, however it would potentially identify projects with greater economic and social benefits. The government does not always have the answer on what the best use for an asset might be, so it is important that proponents are able to approach the government with unsolicited suggestions that will assist in the delivery of key policy objectives. Its key objective is to provide consistency and certainty to private sector participants as to how their unsolicited proposals will be assessed within a transparent framework with key drivers for the QLD Government being how the proposal helps meet a strategic Government objective and value for money. With house prices spiralling in Sydney and Melbourne, Mr Pitt said he wanted to boost net interstate migration to Queensland and to challenge perceptions that the state's economy is in a "holding pattern" after the end of the mining boom. "We know by comparison, we have very affordable housing options in Queensland, particularly when you go into regional Queensland. We want people to see Queensland as an option," he said. The move should "encourage the best ideas and solutions from the private sector and a greater level of private sector investment and participation in projects." As businesses are courted throughout Queensland, PlantMiner can help the private sector in the development and delivery of new infrastructure and services. Procuring plant, equipment or subcontractors is 100% FREE. 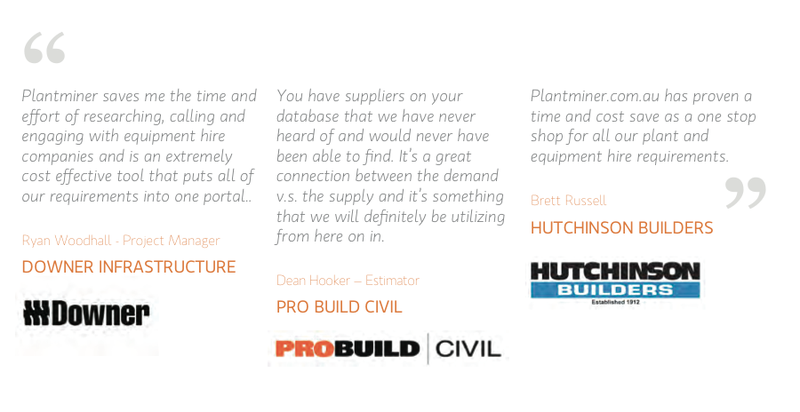 Fill out our online quote request form, and within minutes we’ll call to define your project requirements (machinery requirements, how you want to receive quotes, and even who you want to get quotes from).